Thomas left bequests in his will to Rev. Ezekiel Rogers, his "Deare Sister" Jane Lambert, Thomas Leaver and his wife, John Johnson, Elizabeth Johnson, Thomas Lambert, his "well beloved wife Mary Barker", the brothers and sister of Thomas Lambert if Thomas were to die before reaching 21 and his "beloved Brethern" Thomas Mighill and Mathew Boyes. Thomas is said to be the brother of James, [Ref] but evidence of this is lacking. James Barker died on 5 Sep 1678. He was buried on 7 Sep 1678 in Rowley. He married first Grace Unknown. He married second the widow Mary Wyatt. Nathaniel Barker was born on 15 Oct 1644. He died on 10 Nov 1722. He married Mary Kilbourne. Helliwell [Ref] argues that Nathaniel's wife Mary was probably Mary Kilbourne. James Barker was born on 14 Oct 1686 in Rowley. He died on 16 Mar 1764. He married first Sarah Wicom. He married second the widow Mary (Gage) Jewett. James Barker was born on 21 Apr 1712 in Rowley. [Ref] He died on 27 Mar 1802. He married first Elizabeth Kilbourne. He married second the widow Hannah (Goodridge) Stickney. Jedidiah Barker was born on 14 Apr 1735 in Rowley. He died in 1783 in Bradford. He married Sarah Stickney. John Barker was born on 21 Apr 1758 in Rowley. He married Mary Jackman. Nancy Barker was born on 31 Jan 1788 [Ref, p. 475], probably in Londonderry. 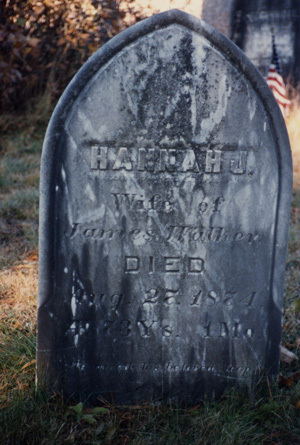 Nancy Barker Ingalls died on 24 Feb 1850, age 53, and is buried in the Grover Hill Cemetery in Bethel. [Ref] She might be the Nancy Barker who married Frederick Ingalls of Bethal, altough her age on her gravestone is wrong. [Ref, p. 333] Her nephew Hall Robertson appears to have named his son of after Frederick. For more information on Abigail, see her page on Bill Fredrickson's website. Timothy Barker was born on 1 Jul 1794 [Ref, p. 475], probably in Londonderry. He died on 11 Nov 1875. [Ref] He married Eliza Town. [Ref, p. 475] Eliza was the daughter of Isaac and Dolly (Gould) Town of Bethel. [Ref, p. 624] She was born on 3 Aug 1804. [Ref, p. 624] She died on 23 Jan 1866. [Ref, p. 476] Timothy and Eliza were buried in the Grover Hill Cemetery (Skillinston Cemetery) in Bethel. Click here to see a photo of their grave on the Findagrave website. Hannah Jackman Barker was born on 26 Jul 1801, probably in Londonderry. She died on 27 Aug 1874, probably in Bethel. She married James Walker. Hannah Jackman Barker was born on 26 Jul 1801 [Ref, p. 475], probably in Londonderry, Rockingham, New Hampshire. Her gravestone says that she died on 27 Aug 1874, aged 73 years and one month. [Ref] She is buried in Bethel, Oxford, Maine [Ref] in the South Bethel cemetery. [Ref] She married James Walker [Ref, p. 637] on 21 Feb 1822. Ancestry.com., Maine Death Records, 1617-1922, online database, Provo, UT, Ancestry.com Operations, Inc., 2010. Coffin, Joshua, "Early Settlers of Essex and Old Norfolk," New England Historical and Genealogical Register, various issues. Dickey, John, Genealogy of the Dickey Family, Worcester, MA, J. Munsell's Sons, 1898. Gage, Arthur E., "The New England Ancestry of Lyman J. Gage," New England Historical and Genealogical Register 53, 1899, 201 - . Gordon, George A., "Watson," Notes and Queries Section, New England Historical and Genealogical Register 38, 1884, 341. Jewett, Frederic Clarke, History and Genealogy of the Jewetts of America, Rowley, MA, Jewett Family of America, 1908. No author, "Grover Hill Cemetery," The Bethel Journals, 23 Dec 2009. No author, "Notes," Essex Antiquarian, 7, 1903, 37. No author, "The Toll Bridge 1869-1927," The Bethel Journals, 11 May 2011. No author, Obituary Record of the Graduates of Bowdoin College and the Medical School of Maine for the Decade Dnding 1 June 1909, Brunswick, ME, Bowdoin College Library, 1911. Paige, Lucius, R., "List of Freemen, " New England Historical and Genealogical Register 3, 1849. Stickney, Matthew A., "Ancient Tax List of the Town of Rowley," New England Historical and Genealogical Register 15, 1861, p. 253. Stickney, Matthew Adams, The Stickney Family: A genealogical memoir of the descendants of William and Elizabeth Stickney, from 1637 to 1869, unknown, unknown, 1869. Threfall, John Brookl, "John Wyatt of Ipswich, Massachusetts and his Wife Mary ( ___ ) Riddlesdale," New England Historical and Genealogical Register 143, 1989, 213 - . Vital records of Bradford, Massachusetts to the end of the year 1849, Topsfield, MA, Topsfield Historical Society, 1907.